Northeast, Southwest, and Southeast) and provide quick access to the vast recreation opportunities New Mexico has to offer. 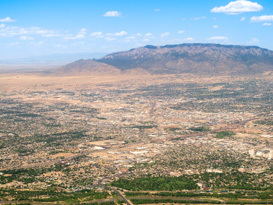 area population of over 800,000, Albuquerque is a vibrant, exciting place to call home. history, Albuquerque is home to many high-tech companies like Sandia National Laboratory, Lovelace Respirator Research Institute, and Intel. sports are more your speed, don’t miss our AAA baseball club, the Albuquerque Isotopes. Series to the Albuquerque Film Festival, Albuquerque’s vibrant cultural scene keeps locals and visitors busy all year long. in the Southwest to established neighborhoods in the Northeast, our Albuquerque Real Estate Guide will help you find that perfect place to call home!